In fact, it has staying power because it works. However, for midsize enterprises, the tools at your disposal most likely don’t deliver the kind of insight you need to prove to those who hold the purse-strings that your email marketing budget is relevant or needs to be expanded to provide a solid return on your campaign investment. Enterprises that send out over 25 million emails per month generally have the data infrastructure to leverage insights that can really drive profitable campaigns. However, for many midsize enterprises (in other words, those who send between several thousand and several million emails per month) there’s a knowledge gap in relevant data insights used to determine campaign profitability which until recently was unbridgeable. In order to gain actionable insight on their email marketing campaigns, marketing teams ultimately need centralized and harmonized data from all their marketing streams (i.e. Google Analytics, Salesforce, Pardot, Facebook, etc) Blending data from the email system and then combining that with the market response as measured by website traffic, conversions, etc will truly let the marketing team measure and ultimately improve their return on investment. And when marketing teams make the transition to a cloud-based, integrated data solution, they position themselves to not only harness the power of a unified data set in order to drive up revenue but also take advantage of cost savings. In fact, research by MessageGears and The Relevancy Group revealed that when enterprises were able to centralize data in the cloud or with hybrid cloud access the result net cost savings was around $75,000 annually due to a simple reduction in resources necessary for synching that data in the cloud. These enterprises also had a 27% higher ROI on their email marketing campaigns. The requirement that marketing teams have now to prove that their email marketing campaigns are cost-effective and bring actual revenue-based results is real. Until recently, it was required but effectively impossible for most midsized enterprises to prove. However, with the advent of cost-effective cloud-based data storage combined with the powerhouse machine learning models behind solutions like conDati, midsize enterprises can bring the required results to the executive boardroom and do so using user-friendly, Netflix-like real-time dashboards and reporting that can help to convince the most reticent CFO to open their purse-strings a little wider. Figuring out the answers to these questions is key for increasing the profitability of your campaigns. Unprofitable email campaigns can cost eCommerce sites large amounts of sales using one of the easiest/cheapest forms of marketing available. This decreases ROI and can continue for months to come if not properly recognized. 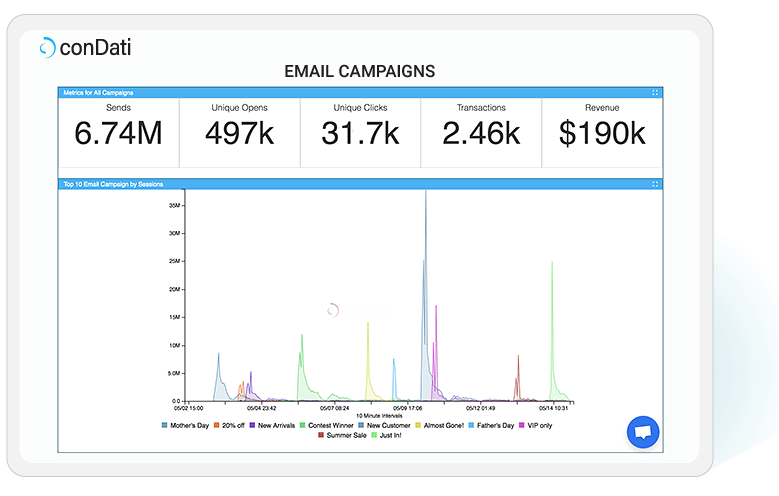 conDati can help you make the most of your email marketing efforts by blending and analyzing all of your marketing data for you, then applying leading-edge machine learning to that data giving marketing teams relevant insights they can use to drive revenue and reduce the costs of their email marketing campaigns.